In this case study we repaired sash windows which are within easy reach of both Battersea and Clapham if you would like to inspect then we would be glad to arrange this for you. We completed sash window repair and sash window draught proofing to a property on Clapham North Side. Our client had rotten sill sections and sash windows that were draughty and letting in the cold. The options made available by three other companies were replacement and repair. We only offered sash window restoration as an option because there was absolutely no good reason to replace these sash windows, despite the extensive repair required and this was exactly the option our client was looking for. Sympathetic sash window restorers. 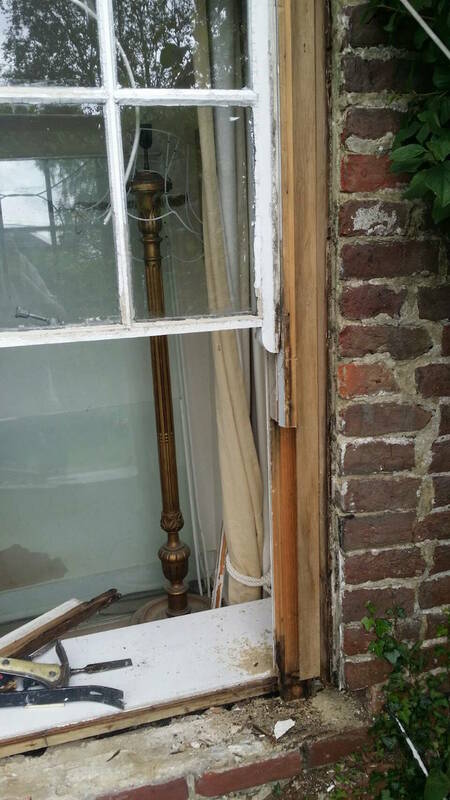 A side note before we get into the repairs – this article doesn’t cover any information regarding double glazing of original sash windows. If you’d like to learn about double glazing and the options available then please take a look at the information provided in the link. It’s always a good situation whereby the client is insisting on repair, London Sash Window Repairs attract clients inline with our ethos of sash window renovation and refurbishment where possible. 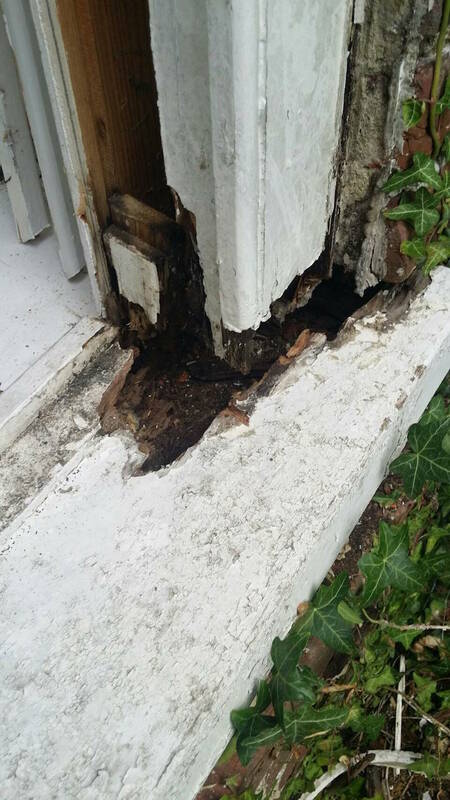 As you can see from the image below, the corner of the sill has completely rotted away and the only long term viable solution is to replace the sill, front cheek, and pulley stile. Once completed, we then draught proofed the sash windows. If you are in Battersea or Clapham then this is the ideal location to pop along to inspect the sash window repairs for yourself. Sash windows Clapham : Sill replacement before our sash window repair service. As you can see from the image above the required repairs are quite extensive. If you are presented with an opportunity to resin repair this. Please do not do it, you will save a couple of hundred pounds at best but almost certainly make a much bigger problem quite shortly down the line. There is significant risk of trapping moisture and Wood Decaying Fungus which will lead to dry rot. This was an option discussed with another window operative. This is why finding the right London sash window company to repair your sash windows is very important. If you look closely at the image of the sill, pulley stile, and front cheek removed, there are still remnants of black fungal damage on the window sill and inner cheek. This can be treated effectively with Cuprinol Five Star wood preservative as the extent of damaged timber is exposed. Prior to sill removal, there was no way to know how far the rot had travelled up the back of the frame. I am not an advocate of replacing more than is necessary, but we must do a lasting job. Because this sill had been left to decay for so long, there is no tangible way to measure how far back the rot had carried, or what damage had been done in the corner, behind the frame. The last thing you want is to spread Fungi into the walls, and then on to the joists. This would result in serious structural repairs. I have seen this example before whereby dry rot had made it’s way into the joist as a result of water penetration from the sash window sill window above being exposed just like this for many years. 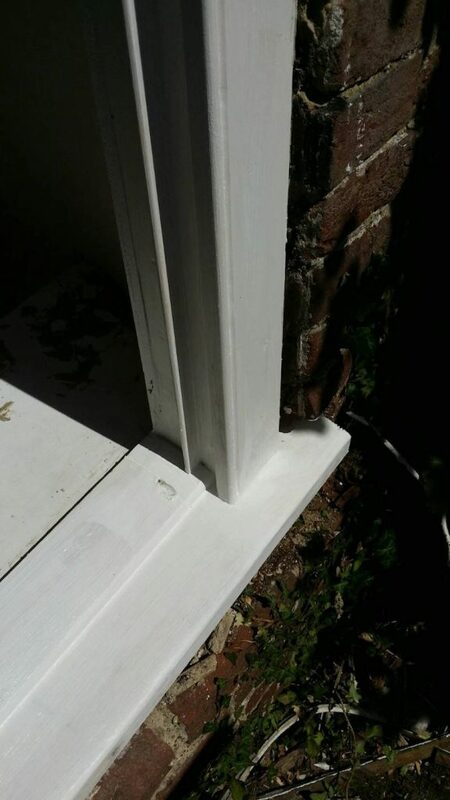 If you’d like to learn more about replacing sash window sills then please follow the link provided. 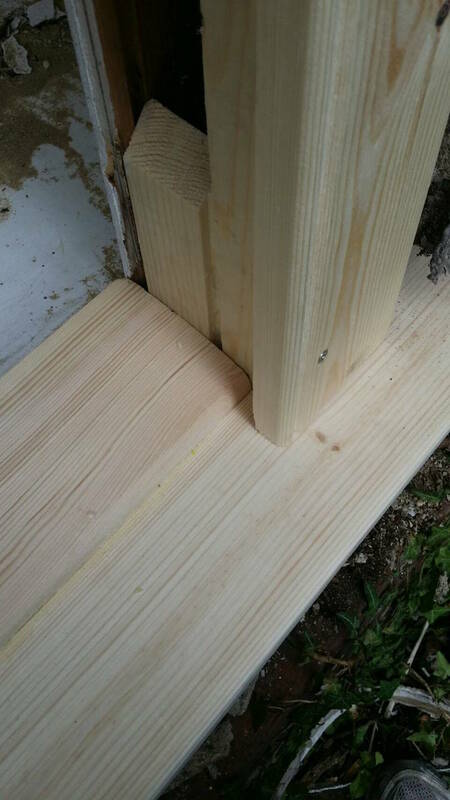 You can also learn more about sill replacement on our commercial page. Once we’ve treated the open reveal and all is dried out. We can now begin to assemble the window back to it’s original condition. Firstly the sill needs to be cut to length and then notched out. Once the sill is offered in, the pulley stile, and front cheek can be cut to length and then fixed. We will join with resin to improve the length of the repair, this will also reduce the likelihood of the timbers splitting, allowing a point for water ingress. This is not because of a poor repair it is the nature of nature – it can move, and two different pieces of timber are likely to move at different temperatures when in direct sunlight. Resin solves this issue and makes for a lasting repair. Now that sash window repairs are effected and sill is replaced we can work on overhaul and sash window draught proofing. To learn more about the draught proofing sash window process please follow the draught proofing link provided which will explain the entire process and show exactly where the brush piles are installed to ensure the window is sealed correctly when we are finished working on the windows. As part of the service we can also offer improved sash window security restrictors that will cover most insurance requirements. Please check the terms on that, insurers vary in their requirements and fine print! Once completed we provide a five year guarantee on the structure of the sash windows and draught proofing. The windows will last that long no problem, but if you paint sash windows well, and maintain at regular intervals there is no reason that in your ownership of the property that sash window sill replacement will ever be necessary again. If you are in Battersea and Clapham then we would very much welcome your enquiry and will help you in finding the most economical and efficient method to bring the sash windows up to good structural condition. If you’d like further useful information on installation or about us please visit the page highlighted. Have you had sash window repairs or draught proofing carried out by London Sash Window Repairs Ltd in Battersea of Clapham? Please feel free to rate our work.